The theatre exercises involve writing short scripts to explore spaces, moods, shades, characters, prose and poetry. The mime and word improvisation make for agility and quick thinking to present fluid montages to help the participants with their sense of direction. A variety of sounds—rain and thunder, sea shores and cityscapes, small and large bands—are created through the body to define the stated scenarios. Taking off from the suggested one-liners, the actors create on-the-spot mini presentations to entertain the audience. Arundhati Chattopadhyaya, a graduate of St. Xavier’s College, began her dance and theatre career in Bombay. She mastered the Pandanallur style of Bharatanatyam from Guru Raghavan Nair. She was part of the Marathi Theatre group Aniket started by Chitra and Amol Palekar and acted in experimental plays. She won the Maharashtra State Award for Acting. She moved to New York City where she taught and performed dance and acted in off-Broadway theater productions. 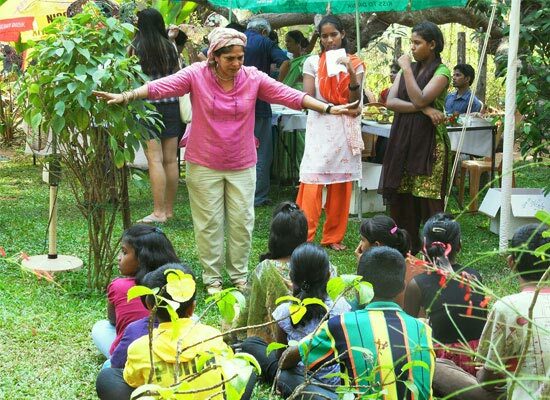 Arundhati currently lives and works in Goa creating a theatre platform for young teens through awareness projects.